America’s latest controversy is over leggings (so proud!) If you’ve been hiding behind your Levi’s over the past few days, I’ll briefly fill you in – United Airlines did not allow 3 females, including at 10 year old girl, to board a plane because they were wearing leggings. When I first heard this news coverage, it seemed rather insane to me that a 10 year old was banned from flying because she was wearing leggings! It turns out that the passengers denied entry to the flight were flying as “pass travelers,” meaning they were relatives or friends of a United Airlines employee. And as they are representing the airline, there is a specific dress code. The more I heard about the situation, the more I understood United Airlines’ stance. Maybe it can be considered antiquated, but it is their company policy for pass travelers and it’s been this way for quite some time. (See all? It does pay to listen to BOTH sides of a story.) Anyway, I still think they could have let the 10 year old slide, but hey, it’s not my call. And since I don’t know any commercial airline pilots giving me freebies anytime soon, I have no personal stake here. Let United do United. But not for nothing, if you are giving me a free ticket and you ask me to dress up as a clown or a ninja or something….I’m stopping by the costume store on the way to the airport. That said, I do love me some leggings! I was thrilled when they came back in style with a vengeance a few years ago. Popular in the mid 80s to the mid 90s, they seemed to have dropped off in coolness for a while, but they are back – and better than ever. There are certain unwritten rules – for example, long and flowing tops, like tunics and ponchos, are your friend. With a little experimenting and people watching, most can make leggings work as pants. Cause if leggings aren’t pants, I’m technically walking around pantless. A lot. 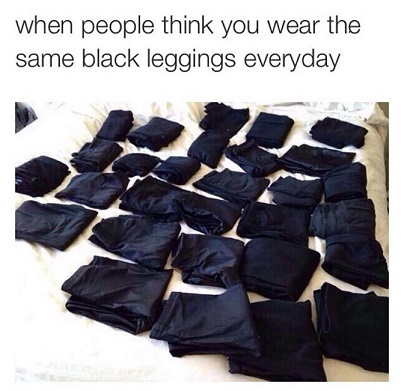 My closet is FULL of leggings – mostly black leggings. 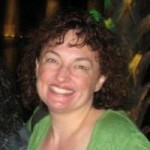 My husband offers up a snicker when I bring another pair of black leggings into the house. Men, right? Of course they are not all the same. Ladies, do you have any issues telling the difference between all of your black leggings? Of course not! It’s easy. I don’t understand how the man in my life can’t see it? A pair with a tie at the bottom of each leg – Which I always step on. Which results in them untying. Which drives me bonkers. The gaucho type style pair that I always grab out of the drawer first no matter which pair I’m looking for – even though I never wear them. How hard was that? How could you not tell the difference? All black – but each unique in it’s own way. Dress ’em up. Dress ’em down. And everything in between. Comfortable, versatile and most definitely my go-to pants.